Marin County is home to some pretty strange things, but coyotes on psychedelic mushrooms? Now that would be far out. That’s one of the possibilities to explain the bizarre behavior lately by more than one coyote off Hwy 1 in the beautiful Bay Area foothills. 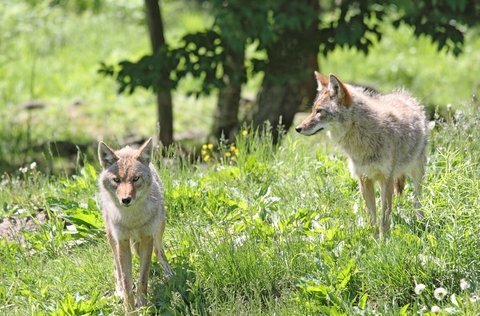 Several residents reported to the Pacific Sun newspaper a coyote or two staring down their cars and bluff charging the vehicles until huffing off into the woods. Lisa Bloch with the Marin Humane Society told the paper it could be the end stages of rabies, which puts animals in a zombie state. But if it’s been going on for three weeks, an animal infected with rabies would be dead by now. Another possibility is magic mushrooms. Could it be that the coyotes got the taste for psychedelics and their strange stair-downs are just the maddening effects of a hallucination? The chances are not that unlikely as the area is known for the natural occurrence of fly agaric mushrooms. Another more likely reason for the behavior is that the coyotes have been fed and they are simply looking for another handout, albeit a bit aggressively. Bloch said feeding any wild animal endangers their safety.